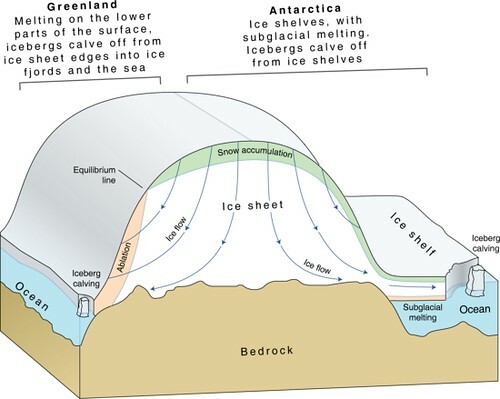 The ice cover in Greenland and Antarctica has two components – thick, grounded, inland ice that rests on a more or less solid bed, and thinner floating ice shelves and glacier tongues. An ice sheet is actually a giant glacier, and like most glaciers it is nourished by the continual accumulation of snow on its surface. As successive layers of snow build up, the layers beneath are gradually compressed into solid ice. Snow input is balanced by glacial outflow, so the height of the ice sheet stays approximately constant through time. 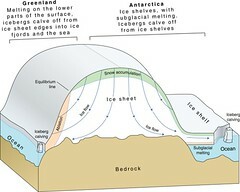 The ice is driven by gravity to slide and to flow downhill from the highest points of the interior to the coast. There it either melts or is carried away as icebergs which also eventually melt, thus returning the water to the ocean whence it came. Outflow from the inland ice is organized into a series of drainage basins separated by ice divides that concentrate the flow of ice into either narrow mountain-bounded outlet glaciers or fast-moving ice streams surrounded by slow-moving ice rather than rock walls. In Antarctica much of this flowing ice has reached the coast and has spread over the surface of the ocean to form ice shelves that are floating on the sea but are attached to ice on land. There are ice shelves along more than half of Antarctica’s coast, but very few in Greenland.